The original church on this site was said to have been one of those founded by San Magno (Saint Magnus) in the 7th century. One was certainly built here by Doge Agnello Partecipazio in 827. It was dedicated to Zacharias, the father of John the Baptist, whose relics were sent as a gift to Venice by the Byzantine Emperor Leo V while the church was being built - these are under the second altar on the right. 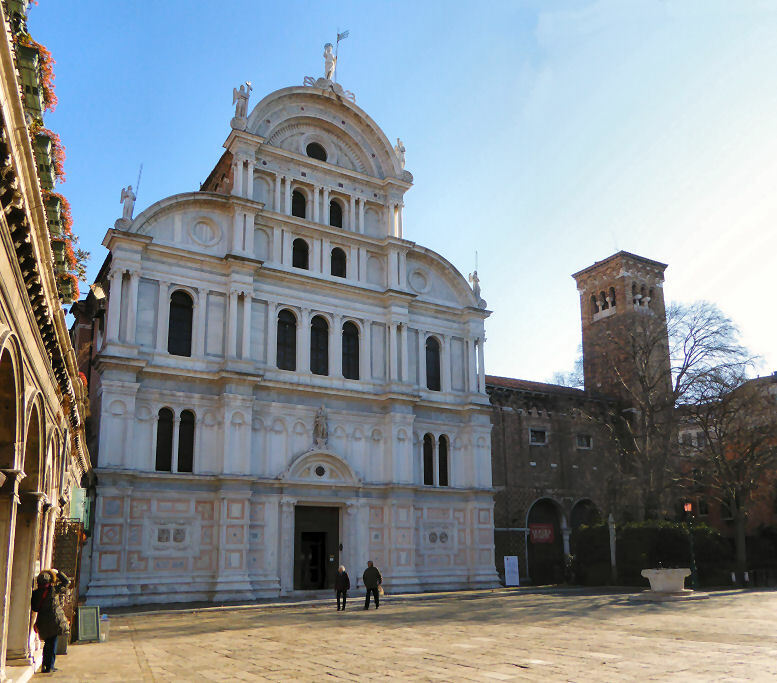 The convent of Benedictine nuns next door is said to have been built at the same time and was for a while the only convent in Venice, and many of its abbesses were the daughters of doges. The church and convent were historically closely connected with the doge – he visited the church every Easter Monday. On 13th September 864, after attending vespers at the church, Doge Pietro Tradinico was set upon by conspirators at the entrance gateway to Campo San Zaccaria and left to die. The ensuing riot meant that fearful nuns had to wait until nightfall to retrieve his body for burial. It was on this visit that Doge Tradinico had been given the corno ducale the cap which all doges since have worn. 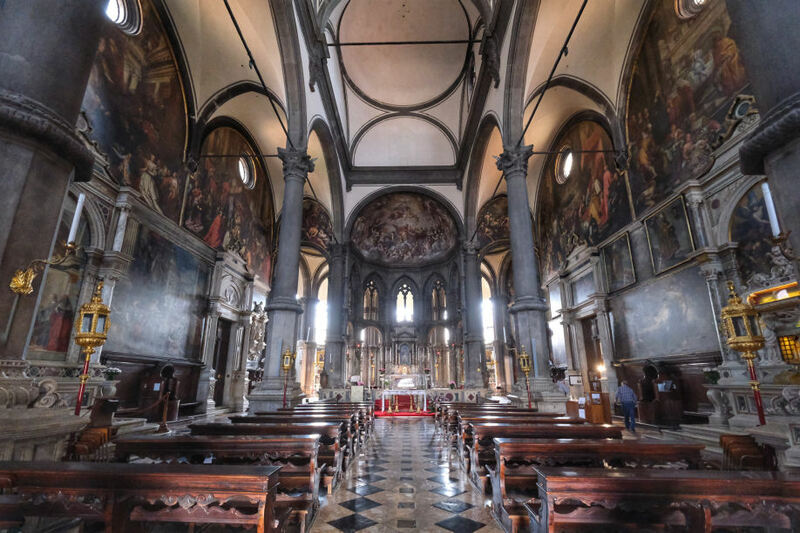 (In fact a total of three doges have been assassinated in the streets around San Zaccaria.) Many doges were buried her from the mid-9th to the late-12th centuries. The original 9th-century basilica was built over in the 10th-12th centuries. It’s said that the original church burnt down in the fire of 1105, with a hundred nuns suffocated. The 15th century church you see as you enter the campo is therefore the third on the site. 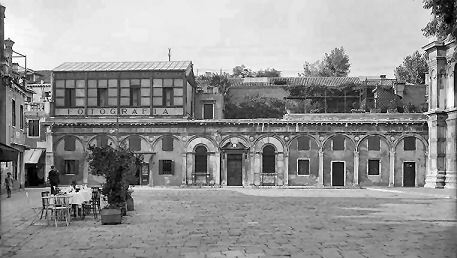 The façade of the earlier gothic church is visible to the right of the current church's façade, along with the attached Benedictine convent, which was closed down by Napoleon and is now a Carabinieri barracks. The 16th century cloister to the left of the church (possibly by Codussi and now walled up) was built over the original convent cemetery. The truly special monumental façade of the main church shows the transition from late gothic to renaissance, as Gambello’s lower two levels are surmounted by Codussi’s plainer upper three colonnades topped by a characteristic semicircular gable and supporting side quadrants with blind occuli, very obviously the work of the same architect as the earlier, and simpler, façade of San Michele In Isola. 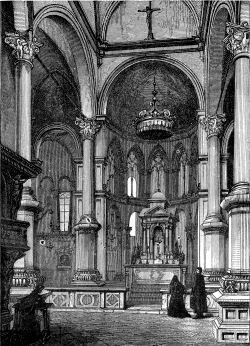 This is Gambello’s work, with the highlight the ambulatory that curves around behind the altar with chapels radiating - a feature that is common in France but rare in Italy and unique in Venice. It may have been inspired by the one at the Benedictine mother-church at Cluny. Red ropes usually prevent access though. The nave is short, with very wide aisles. The piers have impressive capitals, carved by Giovanni Buora, and striking bases. The grills through which the nuns from the convent next door took part in services have long been covered by (big and very ordinary) paintings. Through a door on the right are three chapels and the crypt. The first is the Chapel of Saint Athanasius, which was most of the nave and right-hand aisle of the old church, rebuilt for the nuns in the mid-15th century and then converted into the chapel we see around 1595, when the inlaid choir stalls (by Francesco and Marco Cozzi) were installed. It contains a Tintoretto altarpiece depicting The Birth of John the Baptist or maybe The Birth of the Virgin. An elderly man at the right edge might be Saint Zacharias himself, who you would expect to be at his son's birth, but this identification is not certain. It is over the altar, designed by Vittoria. To the right of the altar is The Flight into Egypt by Domenico Tintoretto. The Crucifixion over the entrance door is claimed to be by Anthony van Dyke and very redolent of the counter-reformation in its minimalness and drama. A door takes you through to the Cappella dell'Addolorata, with cases of relics, and then into the lovely Chapel of San Tarasio (see photo below right). This chapel was the apse of the old church, built in 1440 by Gambello. It was partly built to house the relics of the order, including the bodies of Saints Zaccaria and Tarasio and became a private chapel for the nuns after the expansion later in the same century. Fragments of both the 9th century and the 12th century church's tile floors are visible, and the chapel features some very impressive frescoes in the vaulting by Andrea del Castagno. An inscription reveals that they were painted in 1442 - in collaboration with a certain Francesco da Faenza - almost half a century before the Renaissance finally took root in Venice. 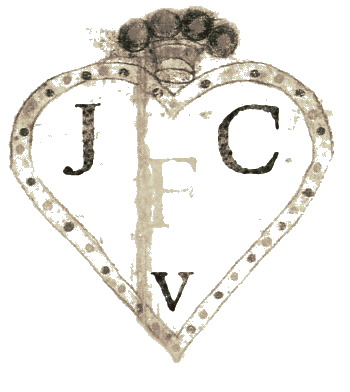 They are the artist's earliest extant work and feature his only signature (Andreas de Florentia). They were discovered in 1923 and cleaned in the 1950s. The oddly youthful Saint Luke may be an early self-portrait of the artist. 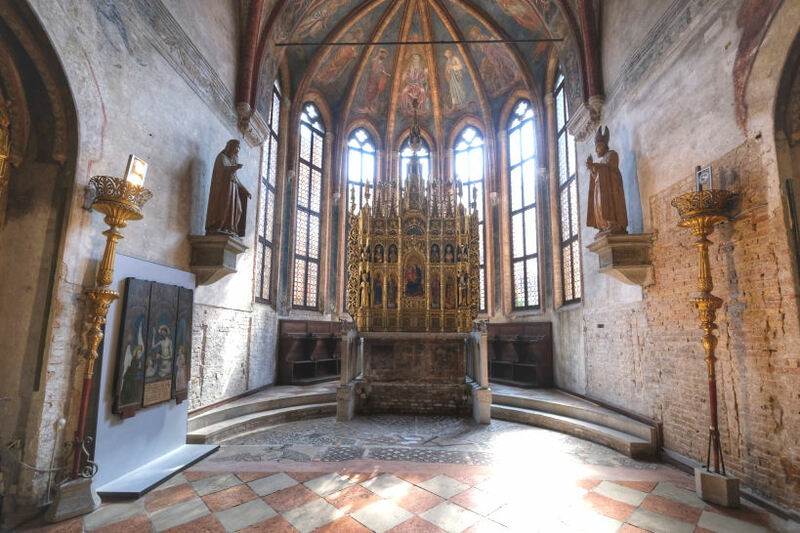 In this chapel you'll also find three well-preserved late-gothic gilded altarpieces by brothers-in-law Antonio Vivarini and Giovanni d’Alemagna. The central three panels on the main level of the high altarpiece (Saints Blaise and Martin, with The Virgin and Child in the centre) are signed and dated 1385 by Stefano di Sant'Agnese dn were taken from another work and inserted in place of a reliquary in 1839. The two saints flanking them (Mark and Elizabeth) are by Giovanni and Antonio Vivarini. It has more saints (said to have also been added later) on the back. There is also a recently discovered and restored predella on the front of the altar, which has been ascribed to Paolo Veneziano. The frescoes and altarpieces were all paid for by individual nuns in the 1440s, from the wealthy Foscari (Elena), Donato (Marina and Margharita) and Giustiniani (Agnesina) families. 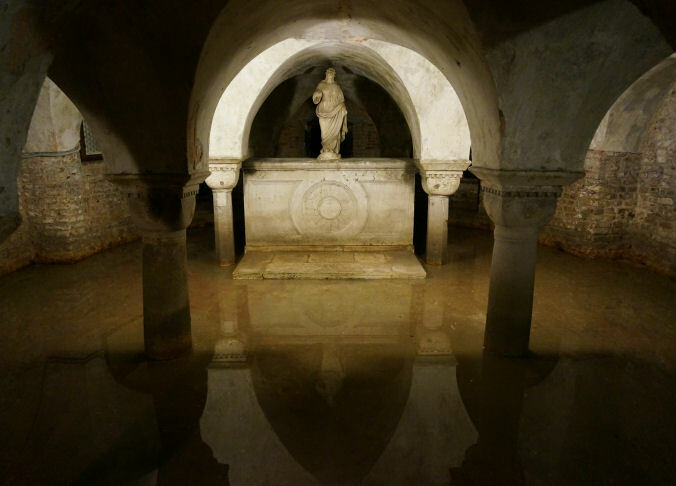 The colonnaded Romanesque crypt below is another relic of the older church and the eight tombs of early doges found down there are usually romantically covered by lagoon water. Giovanni Bellini’s Madonna and Four Saints over the second altar on the left (see right) is one of his very best. It was painted in 1505 when Bellini was about 74. This was the same year that Albrecht Dürer on a visit to Venice described him as 'very old and still the best in painting'. It is painted as a continuation of the surrounding architecture and seems to be a glowing window into another world. Put a coin in the slot to light the light and let yourself be transported. The painting was looted by Napoleon and kept in Paris for twenty years, before being returned in 1817. During that time it was transferred from panel to canvas. This scary process involves sawing away most of the wood panel from the back of the painting and then dissolving the remaining wood down to the back of the paint layer before gluing the paint layer to a new canvas. Only in Paris could this have been done at the time and it is said that this explains the painting’s fine state of preservation. But another book says that the painting used to live over the first altar and was then in a sorry state, due to damage and bad restoration, before it was restored in 1971. To fit into its current altar the painting had a strip cut from bottom, so losing three rows of tiles and no little painted depth. Some sources claim that these losses occurred during the painting's time in Paris. The first tower was demolished in the 11th Century and rebuilt in the 12th with recycled material. It's pyramid-shaped spire is visible in De Barbari's map (see right). The spire and belfry collapsed in 1510 and the tower was rebuilt in its current spireless form. An early (c.1562) Paolo Veronese Madonna and Child Enthroned, with Saints Joseph, Giustina, Francis and Jerome (the Pala Bonaldi) was looted by Napoleon and later (1815) returned to Venice, but to the Accademia. It looks influenced by Bellini, with a setting reminiscent of his San Zaccaria altarpiece, but already has Veronese's characteristic bustle. It was commissioned by Francesco Bonaldi, a procurator of San Marco, as the altarpiece for his funerary chapel in the sacristy here. 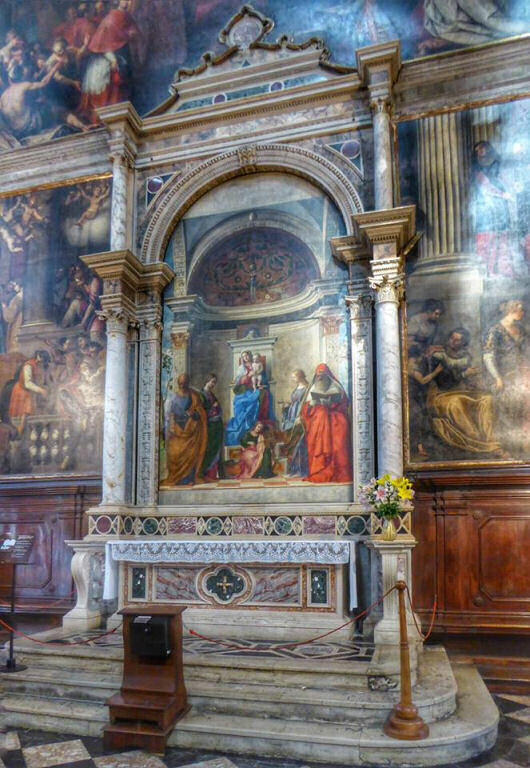 Francesco Guardi painted The Visiting Room of the Nuns at San Zaccaria. 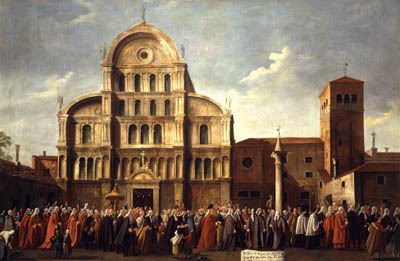 The doge's visit to San Zaccaria on Easter Monday by Gabriel Bella (see right) is in the Querini Stampalia. John Piper produced a lithograph of the façade in the early 1960s. Mary Laven's Virgins of Venice has a lot about the high-born reluctant nuns here, and their consequent unnunlike behaviour, as does Convents and the Body Politic in Late Renaissance Venice by Jutta Gisela Sperling. The convent is also the one in which the heroine is confined in Michelle Lovric’s novel The Remedy. Early Renaissance, and fine of its kind; a Gothic chapel attached to it is of great beauty. It contains the best John Bellini in Venice, after that of San G. Grisostomo, "The Virgin, with Four Saints;" and is said to contain another John Bellini and a Tintoret, neither of which I have seen. ... the Madonna of San Zaccaria, hung in a cold, dim, dreary place, ever so much too high, but so mild and serene, and so grandly disposed and accompanied, that the proper attitude for even the most critical amateur, as he looks at it, strikes one as the bended knee. There is a small entry fee charged to visit the sacristy and the (unmissable) chapels and crypt beyond. It is reportedly possible to see the two cloisters of the convent if you ask the Carabinieri nicely. There has also been art for sale in the rooms in the ex-convent behind the small fenced garden to the right of the church's entrance. But not recently I think.